Kid Icarus's first solo adventure in decades takes a little bit from Starfox and tosses in some Legend of Zelda. Nintendo's announcement of Kid Icarus: Uprising for the Nintendo 3DS finally put an end to countless rumors about the classic NES character's return. But do gamers actually want Pit to fly back onto the scene outside of Super Smash Bros. Brawl? I got a chance to find out at Nintendo's New York 3DS event. Kid Icarus: Uprising features two primary play modes. After players choose one of multiple weapon types, such as a sword or dual orbs that fire off energy bullets, they enter the game's levels in a third person view. Pit will either be flying through the air or running around on the ground. Air-based levels play out similarly to Starfox. Enemies fly onto the screen from all angles and Pit must use his ranged attacks to take them out. Players control Pit with the analog stick while using the stylus on the touchscreen to aim a targeting reticule around the screen. It works pretty well. In the ground-based level, I had a little more trouble adjusting. 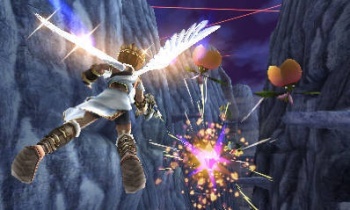 On his feet, Pit can use both melee and ranged attacks, but players must also physically move Pit while rotating the camera. Though combat works virtually the same as when in the air, Pit feels more vulnerable. After surviving a few rounds of enemies, I went up against one of the game's bosses. This boss could only be shot in the face (I'm not kidding), which sounds easy enough until you realize that he's swinging a giant scythe. I died. This was evidently a level of the game that was marked "hard," while the flying level was "easy." Hard might take a bit more practice. Nintendo representatives told me that Kid Icarus: Uprising is "coming soon," so I'm not sure how far along this version was. What I played felt like a mix of Starfox and Legend of Zelda, but the game had a much faster pace than either. Unfortunately, I didn't get to experience any story, but I'm definitely interested to see how deep Pit's adventure will go in Kid Icarus: Uprising's final version. I am soooooo looking forward to this. I loved the original game. Well, I never played the original title until recently, but because of Pit being a playable fighter on Brawl and I played the demo included with the game. Really not my type of game. But his newest itteration on the 3DS actually looks pretty good, I'm looking forward to at least give it a try when it gets released. You have to use the analog stick and the stylus? Not too left-handed friendly... I knew this sort of thing would happen as soon as they anounced it would only have one stick. I was really looking forward to this game, now I don't know. That was my precise thought. *sigh* I suffered through Sisters Mode on Castlevania: Portrait of Ruin, which controlled similarly, even though it was horribly uncomfortable for me, because I thought it was fun. But I don't ever want to go back and do that again. Nintendo, remember the kindness you had for lefties in the Brain Age days, when we could flip the system around and still play. I'm not going to play your games or buy your systems if it's too uncomfortable to control. Ill just wait till they release a dual analog system. Lefty power! I have for many years said that Kid Icarus was the better game between itself and Metroid yet sequel after sequel for Metroid has shown up with only one game on the original GameBoy showing up for Kid Icarus. I am so goddamn pumped for this game you wouldn't even know. It looks like Nintendo did a really, really good job on this. Well gee, when you put it like that it makes total sense why he's so overpowered (or so I've heard) in Brawl. Geez, the last Kid Icarus game was 20 years ago. Never in my wildest dreams did I imagine kid icarus coming to the 3DS I'm just so happy. This is definitely one of those games that makes me want a 3DS when it comes out.